Former Australia captain Stirling Mortlock said the opportunity to play again under Rod Macqueen was causing him to think seriously about joining Melbourne Rebels next year. 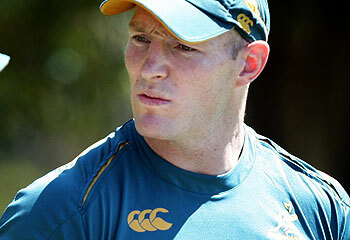 Then again, Mortlock is thinking seriously about all his options beyond this year's Super 14 campaign with the Brumbies. "Probably for the first time in my entire career I'm open to all opportunities, moving overseas, staying here at the Brumbies or going to another Australian franchise," Mortlock said. But it is understood Mortlock, one of Australian rugby's highest-profile and most respected players, is high on the Rebels' hit list and it would have to be said the 80-Test veteran is more than open to the idea of a move to Melbourne. In particular, the 32-year-old centre is attracted by the possibility of once again playing under Macqueen, the man who selected him for his Australia debut a decade ago in 2000. "I just missed the chance to play under him at the Brumbies," said Mortlock, who made his first Super rugby appearance against the Waratahs in 1998. Although Macqueen stood down as Wallabies coach after the British and Irish Lions series in 2001, Mortlock played only the 2000 season under him after missing the entire 2001 international campaign with a shoulder injury. But it is hardly surprising he has such fond memories of that solitary season. Not only did Mortlock kick the angled penalty goal to beat South Africa 19-18 in Durban to clinch the Tri-Nations, but the Wallabies won eight of the 10 Tests he played with them in his debut year. Ironically, the best two matches of that season were ones the Wallabies lost, the epic 39-35 loss to the All Blacks in Sydney in what is regarded as the most exciting Test played and the controversial 22-19 defeat at the hands of England. "At that stage I was a very young player who was just happy to be in that company," Mortlock recalled. "It was an unbelievably successful time in Australian rugby. "I have no doubt Rod has the ability to be that successful again with the Rebels. Look at what he set up at the Brumbies and how well they are still going because of what he did. He always has a different spin from the normal and these days, when so many teams almost seem like clones of each other, you need that point of difference." What also attracts Mortlock to the idea of joining the Rebels is that the Melbourne club is putting a priority on preparing its players for life after rugby. Clearly, if he joined the Rebels, doors would open for him in Melbourne to gain further experience in his planned post-rugby career of finance and investment. "That idea of preparing for life after rugby is one that sits really well with me," Mortlock said. He expects to be in a position to make a decision on 2011 in the near future but first is looking forward not just to a successful season with the Brumbies but an enjoyable one as well, given coach Andy Friend's commitment to playing entertaining rugby. "When you look at the squad we've got, there's an awful lot of players with great attacking skills so we'll be looking to keep ball in hand and play with width and give those quality players the chance to express themselves," Mortlock said. Meanwhile, Will Chambers' much-anticipated debut for Queensland Reds in Saturday's pre-season trial against the Waratahs in Lismore might have to be put on hold because of a strained muscle in his lower back. The Melbourne Storm premiership-winning centre has impressed Reds coach Ewen McKenzie in training, not just because of his own performance but because of the high demands he places on his teammates. "He comes from a tough culture at Melbourne Storm where players are very hard on themselves, so he has been very demanding of his teammates in training," McKenzie said. Waratahs coach Chris Hickey on Wednesday named Wallabies tour bolter Dave Dennis not at lock, the position he filled with surprising success in the midweek tour games against Gloucester and Cardiff, but at blindside flanker. Dennis was delighted to find himself in the backrow, which realistically is the only position in which he could hope to continue his international career.